The Chief of Police holds a press conference and tells the reporters that Superman tore down the city's slum area so that modern apartments must be built in their place. The reporters praised the Man of Steel for his good deeds, but the Chief said that regardless of his intentions, he broke the law and should be punished as any transgressor! The reporters think it's hilarious that the Chief is going to attempt to catch Superman. The Chief states that he will catch Superman because he has imported detective Captain Reilly whom the reporters are very familiar with and very excited by the presence of his expertise and 100% record who always gets his man. Reilly tells the papers to print that Superman is as good as in the Clink. Clark Kent whispers to another reporter that he is a conceited windbag, Reilly overhearing Clark rushes at him and tells him that he'll have Superman bagged in two days! Later, Lois refuses to go with Clark on a date because she heard how he handled Reilly rushing at him (like a coward as usual). Clark suspects that it's someone else, Lois states that it is...it's Superman! Clark walks away sad until he is by himself, then he shrieks with laughter and joy. Meanwhile, the Chief is furious with Reilly because he is doing nothing but sitting back and smoking cigars. Reilly then gets an idea and calls the operator and tells them to tell all news reporters that there is a $5000 reward for the capture of Superman. Again this infuriates the Chief. Reilly tells him to take it easy, that this is how he always starts off. An amature detective, Mortimer Snoop reads the article and is intrigued. Lois also sees the article in fear! At that instant a mental patient named Saunders slugs an employee and crawls out the window stating that he doesn't want to live! The authorities are notified and radio for help which Clark Kent overhears on the scanner. Clark changes into Superman, unaware that Mortimer Snoop is watching! He runs straight for a telephone for his $5000! He contacts Reilly who runs off to find Mortimer who tells him that he saw a man change into Superman, then he presses about the reward. They both wait for Superman by his garments so they can nab him (neither wants to share the reward). Meanwhile, Saunders leaps and Superman launches himself out and downward and catches him just before he hits the pavement (which is damaged from Superman's landing). Before anyone can question him, Superman springs away for his clothes and to write his article. Superman spots the two waiting for him by his clothes. Before Superman shows himself both Mortimer and Reilly pretend to leave to trick the other. They come back almost instantly at the same time, angry with each other's trickery until they notice that the clothes are gone! Reilly is furious and chases Mortimer off, but Mortimer has a secret. He nabbed a memo out of the jacket pocket stating the owner of the clothes must remember to attend the Duncan reception tonight. Later that evening Mortimer shows up but is turned away without an invitation. He calls the Daily Star for the society editor, but Lois answers as she is working overtime. She takes the message about the story if they can help Mortimer get in the Duncan residence. Lois agrees to help him, but is secretly trying to keep him from Superman. After arriving, Lois tells the doorman that she does not know Mortimer and to throw him out. As a last resort Snoop phones Reilly who gets them in. Lois spots Clark and asks for his help to warn Superman. When Reilly walks in he commands all the men to line up against the wall. He and Mortimer argue about who is getting the reward when finally Mortimer is told to beat it! Furious, just before Clark is searched, Mortimer shuts off the lights giving Clark the opportunity to change into his Superman clothes unseen! When the lights turn back on, the two men leap at Superman with both crashing against him, stunning them unconscious. Superman states that now he has them! Seizing his garments, Superman leaps through a nearby window leaving the next morning's headlines to tell its readers that 99% Reilly leaves town, Superman capture was a failure. Story - 4: This issue shows that we have a different Superman here than in modern times. He very much seems to find himself ABOVE the law. It's getting him in trouble. The overall story was pretty good. I especially like how someone found his clothes and waited for him to come back! That was the whole basis for most of the story. Nowadays that isn't mentioned too much. I guess people have made their peace with the whole "what does he do about his clothes" issue. We also get a mention every now and then of a "cape pocket" to explain his clothes in modern times. I also like how this issue, and others in this period, really focus on Clark being the complete opposite of Superman. It just makes sense. Art - 3: The art is pretty good in this issue, but some pages look a little sloppy. Shuster is doing a great job of utilizing backgrounds at this point in his career. His early drawings often skipped the background altogether (still does sometimes). 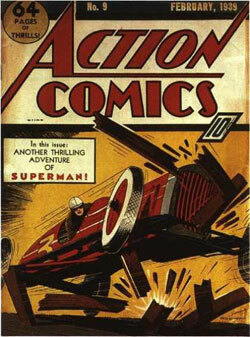 Cover Art - N/A: Another non-Superman cover.